Apple cider vinegar provides exceptional relief for sunburns and this infusion technique just steps it up to a whole other level. If you have found this post and look like a lobster, you will want to grab the apple cider vinegar right out of the bottle, right now, and apply it. 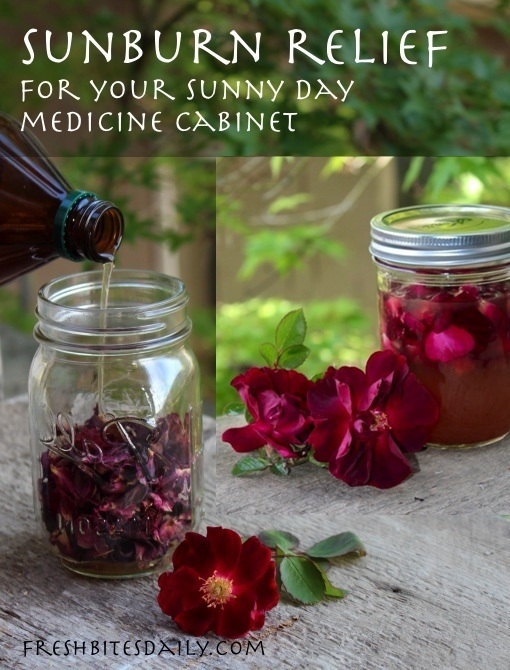 When you’ve recovered from this sunburn, give this project a try because infusing your apple cider vinegar with rose is truly an exceptional product to keep in your pantry. I expect all of us love rose but, if you are like me, you perhaps haven’t considered it as more than a beautiful, fragrant flower. It turns out that it is a favorite among herbalists for skin care and is particularly good at treating mild burns and heat rashes. This “rose super power” first came to my attention via Kiva Rose in her book The Remedy in the Rose. She made the point that she make rose-infused apple cider vinegar every season to have on hand for sunburns. I felt a bit skeptical but she was so insistent that when the roses bloomed that year, I infused some apple cider vinegar. That stuff really works! My go-to for sunburns had been aloe vera and I didn’t really imagine that anything could compete with its effectiveness. Lo and behold, nature offers many solutions for soothing burned skin. In some ways the rose option is more straight-forward than the aloe. I have roses in my yard but aloe plants freeze out here. I can easily buy an aloe leaf but it is a bit messy to process. It’s a great plant (of course) but I keep the rose around too because it is really very easy for me. It may be for you too. Which roses to use for your sunburn remedy? First, if you are a do-it-yourself type, you will wonder which rose you should use. Kiva Rose and other herbalists tend to stick to old-fashioned roses — those thorny roses that want to cling to your shirt as you pick them. If you don’t have access to one, use a rose that you do have and see how it works. Place the rose petals in a clean, quart-sized jar — 1 cup dried rose petals or 2 cups fresh rose petals. Cover in apple cider vinegar (about 2 cups). Give the petals a swish. Place in a cool, dark place for a few weeks (or a few months), giving them a swish daily if you remember (or as often as you do manage to remember). Strain out the rose petals and retain the infused vinegar. First, dilute your vinegar solution with water, about four parts water to one part vinegar. If you have a sunburn or heat rash, you will likely be amazed at how quickly it soothes your skin. If it’s a small area and you’re busy, you may be satisfied with just spritzing the area with rose-infused vinegar or rose water. Allow it to dry and reapply it every few hours. In the case of a larger sunburn needing some bigger guns, soak a cotton cloth in the vinegar or rose water, gently wing out the excess, and lay the cloth on the affected area. Repeat the application every couple of hours. In the same way that I use apple cider vinegar for minor burns and heat rashes, I find rose hydrosol to be effective as well. I mention this because you may keep a rose hydrosol on hand for other purposes — it is great for skin care. You can make your own rose hydrosol at home using the stove-top method we describe at FreshBitesDaily.com, either in this article specifically about rose water (here) or a more general article about homemade hydrosols (here) — both articles will be useful if you have not made it before. I find that the rose soothes the pain basically immediately and does reduce the healing time of the redness or rash. In fact, I am so hot on the rose at this point, I have been trying to figure out how to plant more on my property. If you read this website much at all, you already know that I have become obsessed with planting my favorite herbs on some of our undeveloped hillsides, especially that impacted by the forest fire here in the fall. One of my big rules is that everything I plant has to be deer-proof, gopher-proof, and drought-resistant. Deer loves roses as much as I do and so I wonder if I should find one little corner of our fenced garden…. 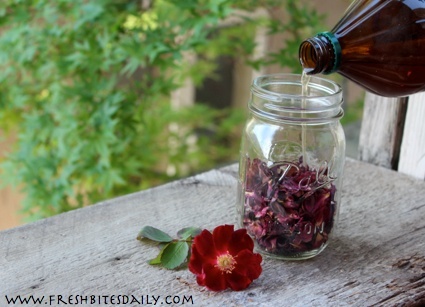 This is a simple process of infusing rose into apple cider vinegar to use for sunburn relief. Place the rose petals in a quart-sized mason jar. Cover petals with apple cider vinegar. Secure with a plastic lid. Store in a cool, dark place for a few weeks or months, swishing daily if you remember. Strain out the roses and retain the rose-infused vinegar. To use, mix up a batch in a small spray bottle, diluting the vinegar with water in a ratio of about four parts water to one part vinegar. Apply often to the sunburned area for relief. From Instagram: Two-toned trees making a come-back from the forest fire.